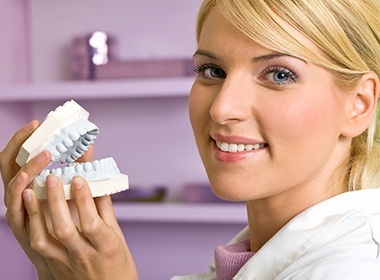 Modern dental materials are good substitutes for dental enamel but are not perfect. The mouth is a wear and tear environment. If God-given enamel has fractured, or worn out, under the same circumstances, then so will the restorative material. Some materials on some people will last forever. However, if there is excessive force (grinding, bruxism) or malocclusion (an improperly aligned bite), it probably won’t. This is okay, as long as the patient realizes this possibility and expects some repair and maintenance in the future. Any suggestion to the contrary is not realistic. This type of complication can be unavoidable. The “nerve,” or pulp, is instrumental in the formation of the tooth. Once the tooth is formed, the function of the pulp is minimal. It also becomes fibrotic and has a diminished ability to heal following trauma - like deep decay. Unlike other parts of the body, once the nerve is infected or traumatized, it doesn’t heal, and causes a toothache. This is why aggressive dentistry which requires excessive tooth reduction should be avoided in cases where more conservative treatment can suffice. For example, if a patient wants whiter teeth and tooth whitening can accomplish that goal instead of veneers (which require tooth reduction), then simple tooth whitening is preferable. Yet another example is that of an onlay versus a crown. An onlay requires less tooth reduction, and it may suffice to strengthen a tooth, instead of the more aggressive tooth reduction involved in a crown that may cause irritation to the pulp. This may be reversible but can result from the bonding procedure. Some techniques for bonding desiccate (dry out) the tooth, which causes a weak bond and sensitivity to hot and cold. 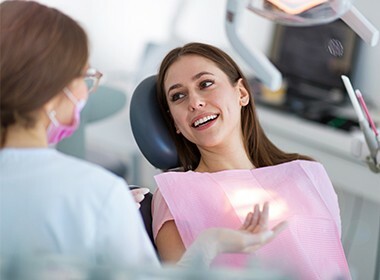 Dr. Salivonchik uses a special bonding technique where special tooth dryers are used during the process to prevent desiccation of the tooth and possible sensitivity. In addition, Dr. Salivonchik believes strongly in the use of a caries indicator. A caries indicator is a special solution which stains even miniscule amounts of decay for removal prior to restoration. The older technique of feeling the decay with a dental instrument can leave behind some decay. This will likely result in sensitivity or a future reoccurrence of decay in the tooth. The quality of dental materials, and more importantly, the work provided by the dental laboratory, is not unlike the differences in quality we are used to in everyday life. Some dental labs sub-contract their work off-shore to China and provide an inferior product, which could result in cracked veneers. Other less reputable labs utilize overzealous marketing to appeal to, and mislead, the public. For example, the idea of ultra-thin veneers (such as Lumineers) to create perfect smiles – without the reduction of enamel – is often unrealistic. Experienced cosmetic dentists know that one of the most common pitfalls of a smile makeover is bulky veneers. This is inevitable without proper reduction, no matter how thin the veneers are. The one exception would be if the teeth are intruded. Dr. Salivonchik uses handpicked technicians from trusted dental labs who are not only artists, but masters of quality.